Every year, more than 300 transfer students make Duquesne their school of choice to earn their bachelor's degree. Many of these students are from Community College of Allegheny County. Transfer students are welcome in both fall and spring for most majors. Duquesne and CCAC now have an articulation agreement for the McAnulty College of Liberal Arts programs! Upon successful completion of the Associate Degree ("AS") in either Arts or Sciences and satisfactory completion of the admission requirements of the McAnulty College, students from CCAC will be admitted into the Bachelor of Arts or Bachelor of Science program at Duquesne University at the junior level with 60 transfer credits applying toward the DU BA or BS degree. Any credits that do not satisfy DU requirements will count as elective credits. Explore the 30 undergraduate Liberal Arts majors and minors to find the right program for you! If you have questions about course equivalents, admissions process and more, please contact Jeff Ptak, Associate Director of Admissions at ptakj@duq.edu or 412.396.5221. Interested in another program at Duquesne? 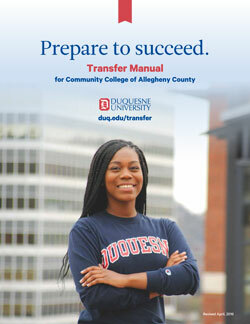 Start by viewing the Duquesne / CCAC Transfer Guide for a complete overview of recommended and transferable courses. Looking for online programs? Learn more about our online, accelerated bachelor's degree and RN-BSN programs.